So who doesn’t spend his lunch playing guitar at the local music store? Not only is it a great way to unwind, but you can find all sorts of reasons why having that job is important. How else would I pay for the guitars I test out? About 45 minutes of Zen guitar later I realized I did still have a job and if I wanted to keep it I better get back. You know I’m rarely at a loss for words, but playing this guitar did it. It’s truly an emotional experience. If you want to know why people buy high end guitars, just go play a Huss and Dalton. You won’t be able to describe it to anyone else either, but at least you’ll know. So I looked up the amazing guitar I was playing on the Web that afternoon. You can see it right there on the home page. Much to my surprise I also found out that Huss and Dalton is about two hours south of me in Staunton, Virginia. Don’t pronounce the “u” or they’ll have you pegged as an outsider. It’s Stan-ton. I called up and spoke to Jeff Huss. We set up an appointment for some Q&A and a shop tour. Heading down through the heart of old Shenandoah isn’t so much a trip of distance as it is of time. No, not to settler days. But maybe roll back 40 or 50 years off the odometer. After 45 minutes of driving from Alexandria, Virginia, civilization quickly fades from view. Before you notice what’s happening, the road stops being flat and starts to undulate like the little kids’ roller coaster at the amusement park. You are entering the foothills of the Appalachians. Out the driver’s side window, (the left one here in the U.S.), the mountains start to rise like a giant room divider. All the junk you don’t want your guests to see is stored behind it. You begin to feel separated from your recent past. Through the other window you see in the distance the green checkerboard of pasture, with the occasional sprinkling of tiny dots of all black cows. Barns so old their wooden skeletons show through holes in the skin, replace fast food restaurants. A stream meanders up beside the road and runs by what’s left of the stone walls of a mill. Its waterwheel is long since gone, no longer able to supply grain to the trains that no longer stop there anyway. The train tracks keep me company for a while, tracing the highway, or maybe the highway traces them. I get the unpleasant feeling of watching your own demise; long ago the highway was mocking the train tracks, knowing 18-wheelers would soon replace the train. Still, the tracks run on to nowhere in particular. Grain silos pop up now and then like giant metallic mushrooms after a spring rain. Now the mountains are on both sides of you, protecting and guiding you forward, blocking out the rest of the world. You have arrived. 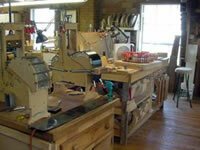 Huss and Dalton guitars are made in a non-descript brick building just south of Staunton. From the outside there’s no hint of the majestic guitars built inside. Jeff Huss greeted me at the door and after getting settled we get to the questions. Guitar Noise: When did you start building guitars? 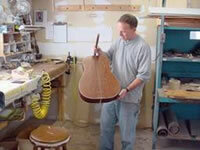 Jeff: I started out building banjos for Stelling, for about nine years. I built my first guitar there on nights and weekends. After Geoff Stelling heard it, he wanted one. So I built one for him. A customer heard Geoff’s and wanted one. 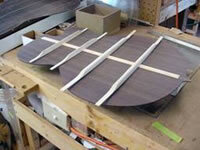 So I started building guitars for Stelling. Then I decided to build them for myself, so I left Stelling and set up shop in my garage. GN: You started building guitars as a hobby. Now that you build them for a living, is the thrill gone? GN: How many different models of your guitars do you sell? Jeff: Currently we have about 15 different models with many options available. GN: How many guitars do you produce? Jeff: We make about 20-25 a month now with about six in production at a time. GN: Do you use computers in your construction? Jeff: Just this here (at the front desk), which keeps track of inventory and invoices. The guitars are all hand made. 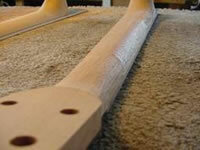 GN: How do you decide what new features you incorporate into your guitars? Do you do research and development, so to speak? Jeff: Right now our efforts are concentrated on being efficient while making the same consistently good guitar. GN: I hadn’t thought of that, but if someone hears one and likes it, they want to be able to buy one that sounds just like it. GN: But you do have a unique feature that I really like. Tell us about the radiused top. 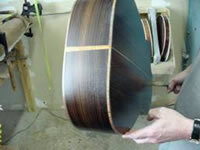 Jeff: The top of most “flat top” guitars is under a lot of stress from the pull of the strings. This pull pre-stresses the top and can deform the top. Our guitar bodies, bracing and top are radiused to take advantage of the strength of the dome and to reduce the pre-stress. GN: And that makes for a better sounding guitar. Jeff: (laughing): It makes for a different sound. A Martin sounds like a Martin because that’s the way it’s built. Our radiused tops, besides being stronger, get a significant boost in mid-range tones and that makes a more balanced guitar. 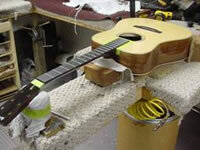 GN: What is the most time consuming aspect of building your guitars? Jeff: The finishing takes probably 30% of the construction time. You have to be able to hang a Huss and Dalton on the wall next to high end Martins and Breedloves. 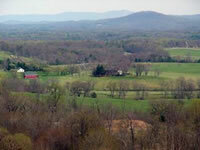 GN: Does building in the Shenandoah’s have any drawbacks? Jeff: Perception is a hard thing to change. 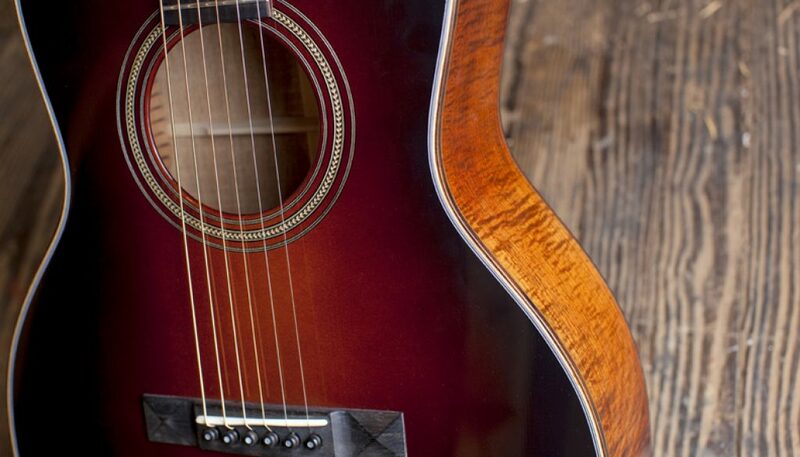 We get reviews that say the Huss and Dalton is a great, driving Bluegrass guitar, and it is. But it’s more than that. It’s like saying the Lowden is good for Celtic music because it’s built in Ireland. GN: You are about to make guitar number 1,000. Do you ever step back and shake your head in disbelief? Jeff: (laughs) All the time. GN: What’s the latest and greatest in guitars now? What’s the thing to look for? Jeff: One of our guys says it’s like Koa with balls. GN: Last question. What do you play? Jeff: (laughs again) A factory second. Let me just say as I close, if you are in the market for a high end Martin, Taylor, Breedlove, etc. you owe it to yourself to track down a Huss and Dalton before you make your choice. Great article, I completely agree, my H&D CM cutaway is one of the best sounding guitars I have ever played and I play it daily. Thank you for an interesting article. Would have loved a bit more on guitar-making rather than road trip description, but would gladly have both adequately covered. Special thanks for the Australian Blackwood response by Jeff Huss, as I am currently paying off a TOM-M Custom with AB back and sides that I fell in love with two and a half months ago. Truly a can’t-sleep-after-you-play-it guitar!